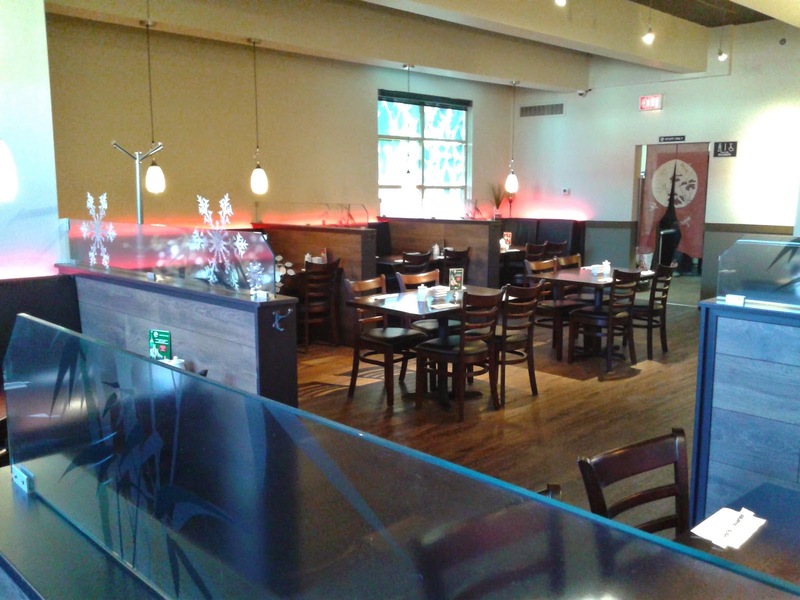 The interior of the restaurant is very large and consists of multiple dining areas. I was seated in the largest dining area in a corner behind a divider, so I could do anything I wanted without being noticed. I guess I didn't need that privacy because the photos I took with flash turned out to be worse than the ones I took without (the flash made the table completely black, so everything looked like it was floating in space). The lunch specials (PDF) were a steal, allowing you to choose three items from a select list for $8.95, four items for $11.95 and five items for $14.95. I guess they didn't think about including an option to choose six items for $17.95 (or seven items for $20.95), which would be helpful for people like me who want to try everything. 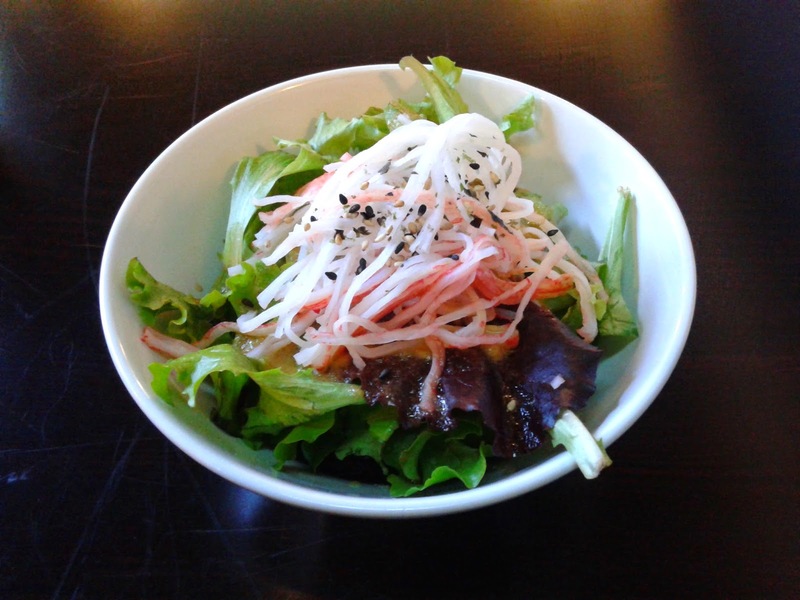 The salad turned out to be quite large, dressed with a strong, tangy vinaigrette and accompanied by a generous helping of imitation crab meat. I enjoyed how the crab meat worked well with the vinaigrette, but the arugula leaves in the salad were quite mature, making them overly large and chewy. 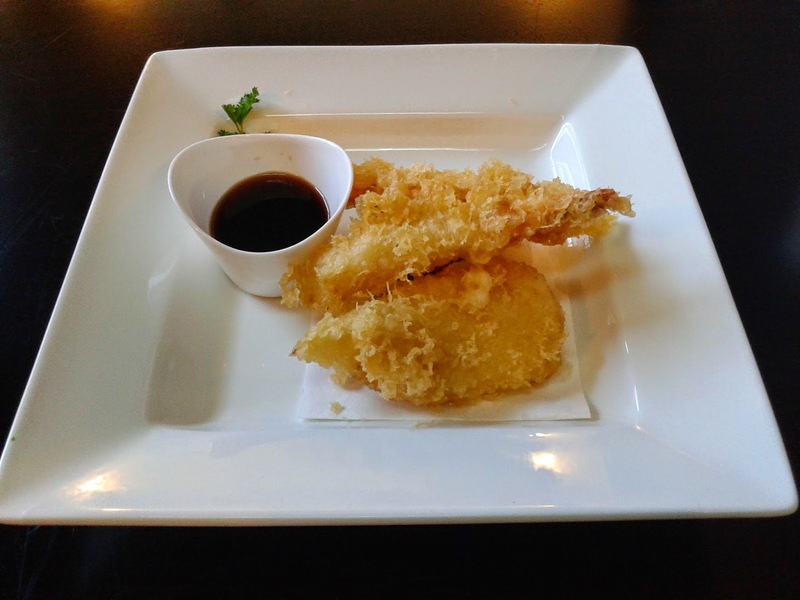 The Assorted Tempura consisted of one piece each of prawn, carrot, broccoli and yam. My favourite was the broccoli because it was nice and juicy and not thickly covered with batter. Unfortunately, the other pieces were quite greasy and covered in copious amounts of batter which were quite hard. 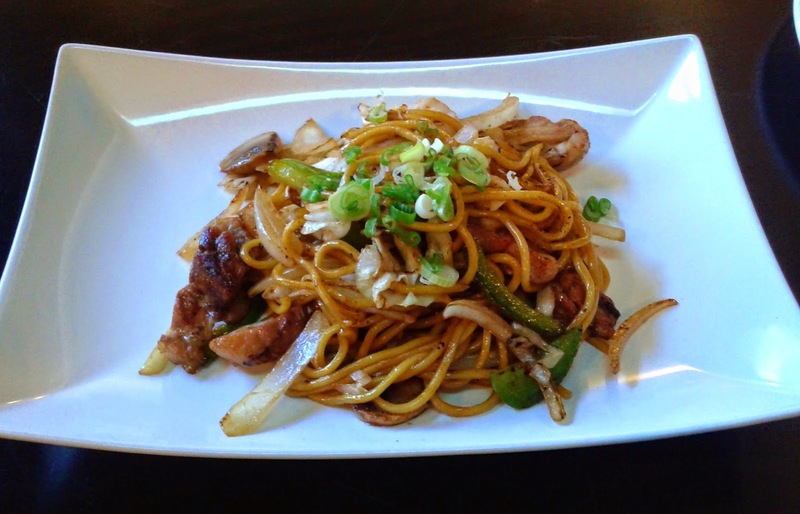 The Chicken Yaki Soba was still steaming when it was brought to me and gave off an appetizing, aromatic flavour. The yakisoba noodles were quite chewy and almost al dente. The chicken was tender enough, but I wish it had more of a grilled flavour. 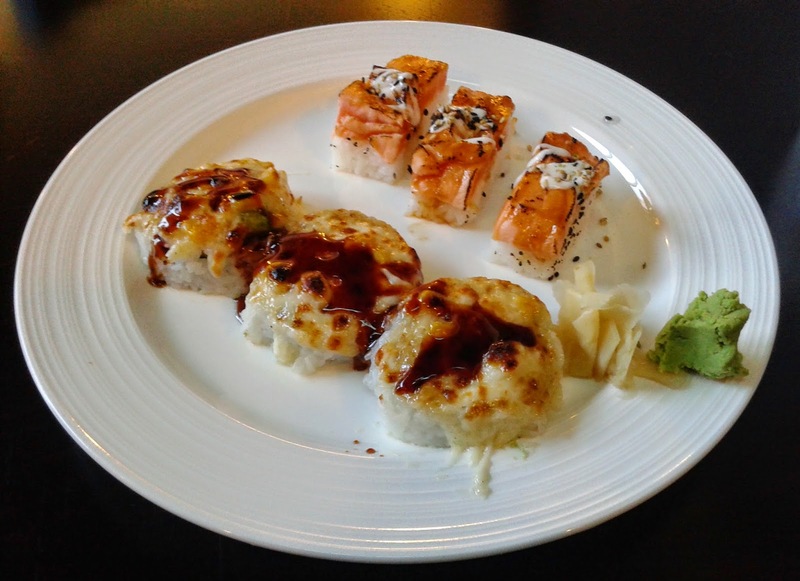 The Aburi Salmon Oshi looked right, but turned out rather bland. For some reason, the salmon was close to being tasteless, so all the focus shifted to the rice, which was slightly mushy and also failed to provide much flavour. The Lion King Roll, which consisted of prawn tempura, crab meat, avocado, corn and mozzarella cheese, was much better. The mozzarella cheese and teriyaki sauce was a successful combination, and I also enjoyed the corn and sweet crab meat inside. The whole roll was delightably soft and full of moisture after being baked. 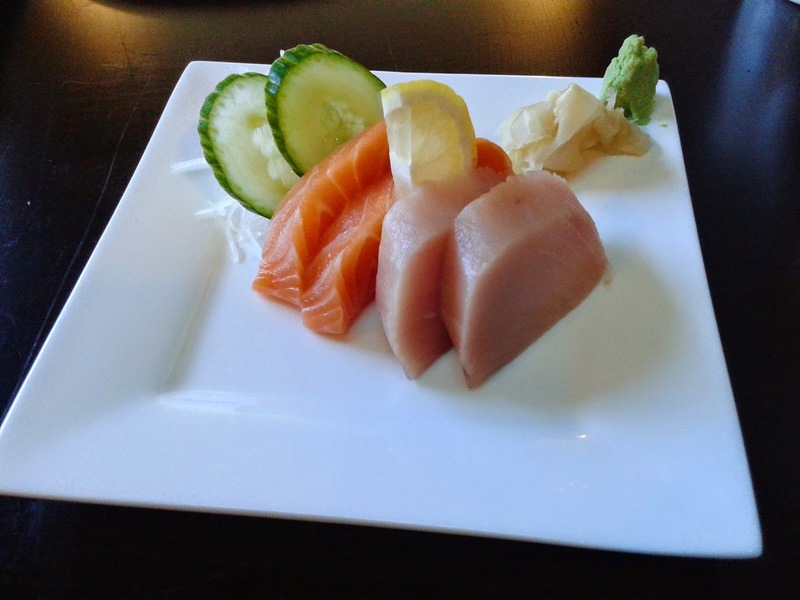 I wanted to try some sashimi too, but I had exhausted my limit of five items with the Lunch Plate C so I had to order the sashimi separately ($6.50). The cuts were quite generous and everything was plated nicely. The Salmon Sashimi had a soft and jelly-like texture, but it was lacking in flavour just like the Aburi Salmon Oshi from earlier. The slice of lemon cured the Tuna Sashimi from its slightly fishy flavour. It was still a few minutes away from being fully thawed. Even though I was seated in a secluded corner of the restaurant, the servers came around to me quite frequently to make sure things were okay. The service was also friendly and attentive, though there weren't many diners, probably owing to the fact that it was New Year's Eve. The menu is quite extensive and there is a large selection of special rolls, though some of the food (like the Aburi Salmon Oshi) can use some improvements. 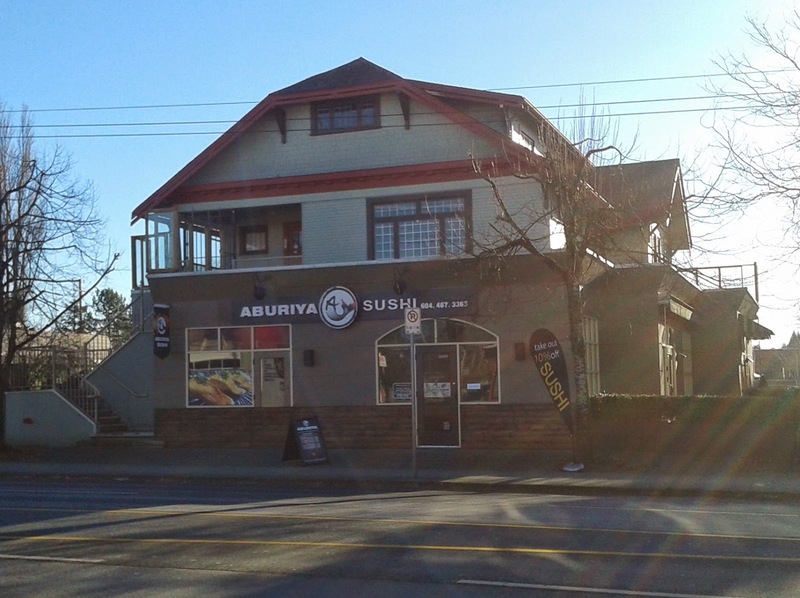 As for virtually every other Japanese restaurant in Maple Ridge, I found the prices to be quite affordable.